Among the company’s plans: to release more details about its supply chain, publish an updated “Restricted Substances List,” and audit processes by the end of April 2013 and every year thereafter. Zara became the eighth brand to sign on to Greenpeace’s zero-discharge roadmap after a damning report on the fashion industry’s worst polluters. Zara became the eighth brand to sign on to Greenpeace’s zero-discharge roadmap nine days after the environmental nonprofit published a damning report on the fashion industry’s most toxic polluters. More than 315,000 people participated in its public campaign against Zara, according to Greenpeace, including tens of thousands who took action on Facebook and Twitter. Another 700 protested outside Zara storefronts, a number resorting to a form of street theater, in cities such as Budapest, Geneva, Hamburg, Hong Kong, and Madrid. Other brands that have pledged to do the same are Adidas, C&A, H&M, Li-Ning, Nike, Puma and, most recently, Marks & Spencer. Zara became the eighth brand to sign on to Greenpeace's zero-discharge roadmap nine days after the environmental nonprofit published a damning report on the fashion industry's most toxic polluters. More than 315,000 people participated in its public campaign against Zara, according to Greenpeace, including tens of thousands who took action on Facebook and Twitter. Another 700 protested outside Zara storefronts, a number resorting to a form of street theater, in cities such as Budapest, Geneva, Hamburg, Hong Kong, and Madrid. “Greenpeace welcomes Zara’s commitment to toxic-free fashion. If the world’s biggest fashion retailer can do it, there’s no excuse for other brands not to clean up their supply chains and make fashion without pollution,” Martin Hojsik, Detox campaign coordinator at Greenpeace International, says in a statement." 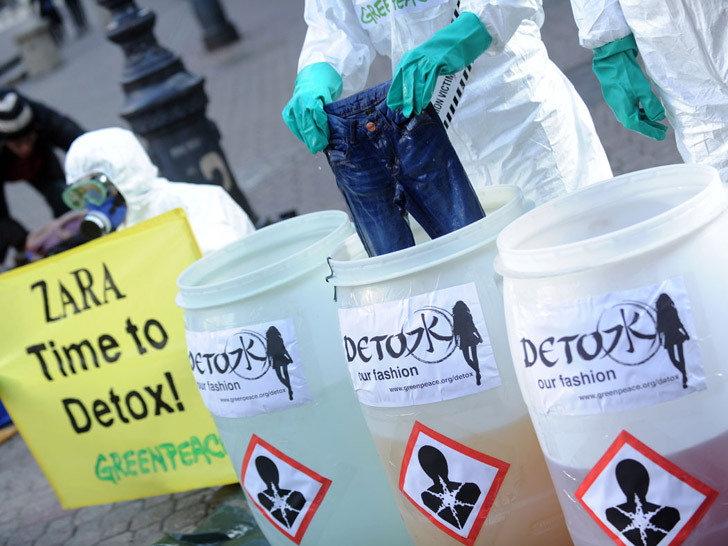 “People around the world have spoken out against toxic fashion and it’s now time for other brands such as Esprit, Gap, and Victoria’s Secret to listen to their customers and urgently detox," he adds.